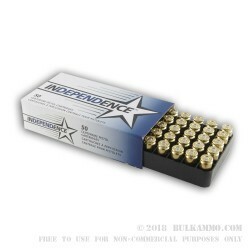 Load your Glock 23 mags or 40 S&W sidearm with these full metal jacket rounds from Independence on your next trip to the range. Each round is loaded to propel the 165-grain FMJ projectile at speeds of 1130 fps for consistant accuracy downrange. The boxer primed and reloadable brass cassing is crowned with a brass jacketed full metal jacket projectile for smooth feeding into your weapon's chamber. If you're looking build on your self defense skills by training more often and honing in your muscle memory with more trigger puls, this round is excellent for its balance in value and performance. Shooters have long trusted Independence cartridges for their reliable performance and high quality components. Independence is owned by ATK which is known to be the largest and most reputible parent company to other brands such as Federal, CCI, Blazer and Speer. 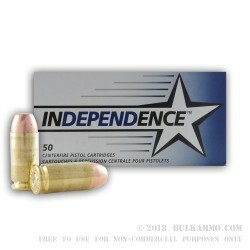 Load your range bag with these 40 S&W FMJ rounds and feel confident in the performance you'll experience from high quality standards at Independece and low cost per round on each trigger pull.